Copyright 2001 Palm Beach Newspapers, Inc.
HOLY WAR, INC.: Inside the Secret World of Osama bin Laden, by Peter L. Bergen. Read by the author, 4 1/2 hours, abridged, Simon & Schuster Audio, $25. A more important book is not going to be published anytime soon. 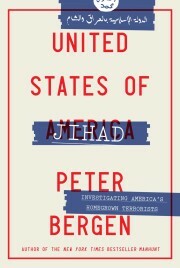 Peter Bergen, CNN’s terrorism analyst, not only gives us a riveting read about Osama bin Laden, but he carefully builds the background behind the ticking terrorist time bomb that exploded on Sept. 11. Bergen (along with CNN’s Peter Arnett and Peter Jouvenal) interviewed bin Laden in 1997. He’s reported about Muslims and the Middle East since 1983. But this is not a recycling of sketchy profiles. Bergen, born in Minneapolis, raised in London, offers fresh facts and wraps the crucial history of today’s terrorism around the story of the world’s most wanted man. Nor is this dated reporting that leads up to Sept. 11 and stops. Bergen finished his original manuscript in August. After Sept. 11, he rewrote to include anthrax deaths in Palm Beach County and elsewhere. Bergen writes in the first person, which yields some humor and much color from dusty, noisy, exotic places. And his reading of his own audio book perfectly complements that writing. He avoids a dense, confusing story by supplying context to interviews with Arab-world heavy hitters, including al-Qaeda members: What they’re wearing. Where and how they live. Those details help define names that easily confuse the Western mind. Details of his interviews add mystery to it all and, in the case of bin Laden, show the high-end smarts of media-savvy terrorists. Bergen is generous crediting other journalists throughout his story (and with a thorough book bibliography). Follow Bergen’s journey, and you’ll get an objective look at bin Laden and the frightening, high-tech terrorist network that includes cells in dozens of countries, including the U.S. You also get the perspective of history, which is crucial to understanding people who are ready and willing to die as blissed-out martyrs. Anyone expecting terrorism-free, happy days once “evil-doer” bin Laden’s head is on a stick somewhere is in for a chilling surprise, thanks to Bergen’s exceptional reporting. GRAPHIC: PHOTO (B&W), Tape jackt, HOLY WAR, INC.: Inside the Secret World of Osama, bin Laden, by Peter L. Bergen.